LITTLE ITALY — The Meatball Shop founder Michael Chernow is hoping to use his celebrity status to change the way New Yorkers eat fish, with the opening of his first seafood restuarant. 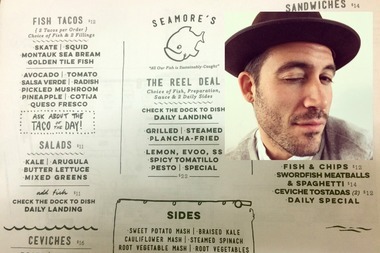 Seamore's, opening soon at 390 Broome St., is Chernow's first foray into the seafood world, and he's hoping the new concept will get his followers to swap out their taste for farm-fished tuna for locally sourced fish species that are less familiar, like seabream and sea robin, Chernow said. "I personally believe that I have a following with the Meatball Shop," he explained to Community Board 2's liquor license committee on Tuesday night. "And honestly, I think that with my track record, people will come. They'll give it a try. They'll come at least once. And if I can get them that one time, we'll have guests for life." The new venture was first reported by Bowery Boogie last month, when Chernow circulated letters asking for community support for his liquor license application. Seamore's menu will include ceviches, fish and chips, and an Oh-Boy, a spin off of the southern Po' Boy, made with sea robin and Montauk sea bream and served with salad or sweet potato fries. Fish tacos made with skate, squid or golden tile fish will also be available, two at a time for $12. The main dish, dubbed "The Reel Deal," is made with a choice of fish grilled, steamed or fried fish, topped with one of four sauces: pesto; lemon, extra virgin olive oil and sea salt; spicy tomatillo; and a housemade "special" sauce. Chernow is planning to source his fish from Montauk supplier Dock to Dish, 100 miles away from the city, where fish swim wild, he said. Dishes range in price from $11 to $22. The eatery will also include a nine-seat bar and a soft-serve machine, according to a floor plan. CB2's liquor license committee voted to support Chernow's application for a full liquor license. "I'm taking just a little step to the side from the day-to-day of Meatball Shop," Chernow said to the board. "Because I'm incredibly passionate about seafood."